How did Amazon conquer American retail? How Did Amazon Conquer American Retail? $760 Million in Public Money Didn’t Hurt. Is this where they keep the tax money? It’s hard to remember holiday shopping before Amazon, which has put a Santa’s workshop’s worth of goods within 48 hours of tens of millions of Americans, and devastated tens of thousands of local businesses who once sold things in person. The company couldn’t have done it without us. We’ve embraced the convenience and prices of e-commerce, of course. But we’ve also supported the tax breaks that have made the company so competitive with local bookstores, Best Buy, and everything in between. Like most companies of a certain size, Amazon plays aggressively with states and localities to get tax breaks, pitting politicians from neighboring municipalities against each other in a prisoner’s dilemma. A new analysis from the Institute for Local Self-Reliance, a nonprofit that advocates for local economic development, tries to put a number on just how much Amazon has saved from taxpayer largesse in the United States: $760 million between 2005 and 2014. It’s a figure, according to ISLR’s exhaustive new report, that’s equal to 17 percent of the company’s global profits during that time. And it’s likely an underestimate. In its early years, Amazon built enormous rural distribution centers. By staying out of heavily populated states like New York, Texas, Pennsylvania, and California, the company dodged sales taxes and consolidated a competitive pricing advantage against local and national retailers. Then, in the mid 2000s, the company’s strategy shifted. It struck deals with state legislatures to avoid sales taxes, and with local jurisdictions on property taxes. Distribution centers opened in metropolitan Chicago and shuttered in rural Kansas. Between 2005 and 2014, more than half the company’s “fulfillment centers” were built with public subsidy, according to ILSR. At both the state and local levels, the company has wielded extraordinary leverage. In April 2011, a coalition of small businesses, chain stores, and Tea Party activists in South Carolina rallied the state house to deny the company a sales tax exemption. The company said it would mothball its warehouse there, and months later, the legislature compromised. Amazon opened the distribution center, and a second facility the year after, with in-state sales taxes postponed until 2016. 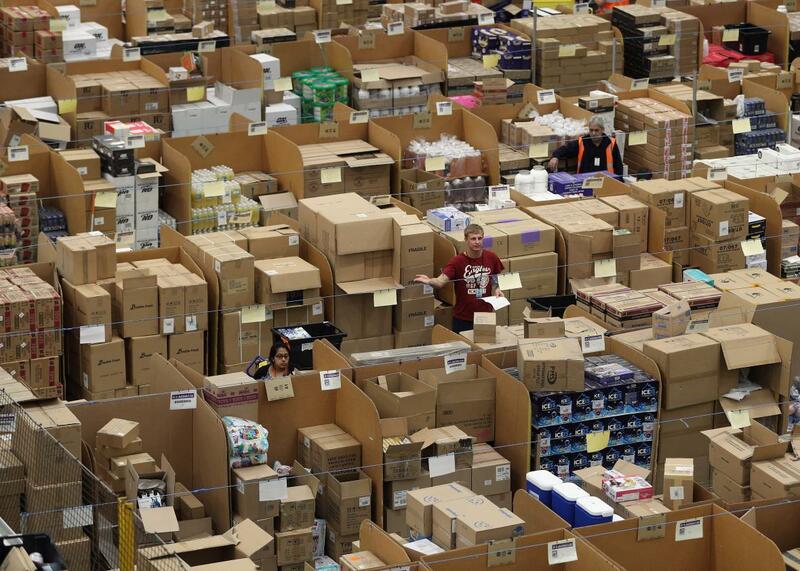 Texas sued Amazon for $269 million in taxes the company had avoided by secretly operating a warehouse there. The company shut down the warehouse, and eventually settled. States continued to forge these deals, though Amazon’s strategy now requires metropolitan distribution centers to facilitate two-hour delivery. Most Americans pay sales tax when ordering from Amazon. But at the local level, the Amazon tax avoidance machine motors on. In June, Amazon became one of very few companies to successfully negotiate a tax abatement in Harris County, Texas. The company had told county commissioners that it had alternate sites in mind near its facilities in Haslet (277 miles away) and San Marcos (165 miles away), as well as out of state. In May, the company decided to add a second warehouse in Joliet, Illinois, after the state granted tax breaks worth at least $2 million a year. Amazon will pay no corporate state income tax for 10 years in Illinois. The mayor of Joliet said the positions were “great jobs,” although the job description noted that workplace temperatures ranged from 60 to above 90 degrees, and that workers needed to be willing to work all shifts, and stand and walk for 10 to 12 hours while pushing, pulling, squatting, bending, and reaching. The company’s success is sometimes said to be due to its unrivaled economies of scale in storage and distribution, which are presented to customers in savings of time and money. But the tax break bounty is another fruit of the company’s size. None of its Main Street rivals has the political influence or employment impact to negotiate such deals. Through convenience and low prices, Amazon may create sales where there were none before. But it also, indisputably, saps revenue from brick-and-mortar establishments. That in turn deprives cities of jobs and commercial property taxes, chips away at the vitality of downtowns and commercial strips, and forecloses on the social contributions of local businesses and franchises. In 2014, for example, the company sold $2 billion worth of goods in Illinois without employing a single person in the state. The ILSR report assumes that Amazon’s growing market share—it has now topped $100 billion in annual revenue—is a substitute for spending elsewhere, and for brick-and-mortar spending in particular. That’s not entirely true. But their estimate gives us an inkling of the bite that the company is taking out of traditional retail setups, vacating 135 million square feet of retail space in 2015 alone—or 700 big-box stores and 22,000 Main Street shops.